Featuring die-cast zinc base material. The Liberty 1-1/2 in. Bronze with Copper Highlights Contempo Knob is a great way to add a finishing touch to the cabinetry in your living space. Hardware included for installation. From Liberty Hardware, this ceramic and zinc die cast Finial Knob adds a beautiful vintage touch to your room. Multiple finishes available. Installs easily with included hardware and is a noticeable change for your furniture or cabinets. The 1.5inch Refined Comfort knob by Liberty gives your room an upgraded look without fuss. Softly geometric, this style is easygoing yet contemporary. Ideal for craftsman and farmhouse style décor. 1-1/2 Contempo Knob, 1 per pkg Featuring die-cast zinc base material. The Liberty 1-1/2 in. 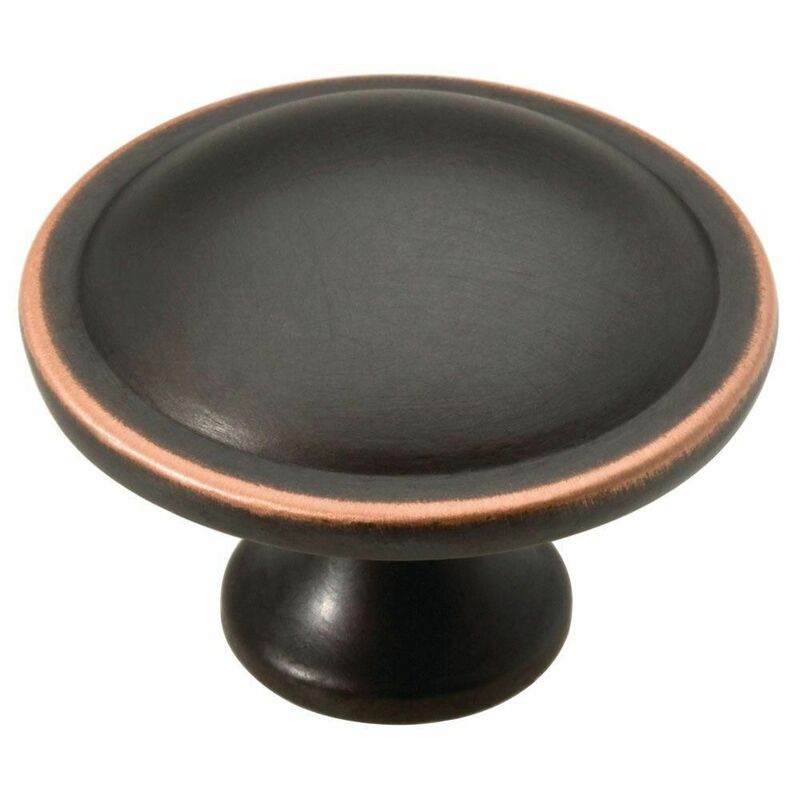 Bronze with Copper Highlights Contempo Knob is a great way to add a finishing touch to the cabinetry in your living space. Hardware included for installation. 1-1/2 Contempo Knob, 1 per pkg is rated 4.8 out of 5 by 25. Rated 5 out of 5 by JN from We purchased these cabinet knobs four years ago for a... We purchased these cabinet knobs four years ago for a manufactured home kitchen I did some redecorating in. Now that we are building a home, I can't believe I returned back for these same exact knobs! They are excellent quality, were very durable, and a great value for the money. The finish is true to the picture and they are heavy and well-made. I highly recommend, whether it's for a manufactured home or a high-end new build! Rated 5 out of 5 by Renos4ProsAndJoes from I recently completed a home renovation project where I replaced all the interior doors units (whi... I recently completed a home renovation project where I replaced all the interior doors units (which includes the door itself, the hinges, the frame, and the trim). I decided to go back with oil rubbed bronze hinges and doorknobs for all the bedroom, bathroom, and closet doors. But when it came to the closet bifold doors, I had to decide whether to use the wooden knobs that came with them or try something else. These knobs were the "something else." They were an awesome option because they are larger than most standard sized cabinet knobs. This made them feel and function the same as the wooden handles that came with the door. But these knobs compliment the other oil rubbed bronze hardware really well and tie every thing together. Additionally, these knobs don't have to b painted like the wooden ones. So I saved a little time there as well. And i didnt have to buy any extra screws because the knobs came with two screw options (a standard and a long) in the package. The long screw worked perfectly. If you plan to use these knobs on something other than cabinets, I would recommend that you first make sure that they are the correct size for your application. I took my wooden knobs (that I didn't want to use) with me to the store to give me guidance. By being able to compare the cabinet knobs in the store to the wooden knob that was designed and sized for a closet bi-fold door, I was able to ensure that I had the right size before I left the store. And for your information there were only one or two knobs in the store that were actually big enough to pull this off without feeling small in hand. Rated 5 out of 5 by Lisa from The Knobs work very well. They are large and easy... The Knobs work very well. They are large and easy to grab when you’re opening drawers or doors. Rated 5 out of 5 by HomeDepotCustomer from It was a good replacement.... It was a good replacement. Rated 5 out of 5 by HomeDepotCustomer from I replaced the handles of the vanity I also got... I replaced the handles of the vanity I also got from HD. Rated 5 out of 5 by Toby from Product was exactly as I expected.... Product was exactly as I expected. Rated 5 out of 5 by kim from this product is great. i am redoing my kitchen and... this product is great. i am redoing my kitchen and took off old silver knobs and got these here at the store. It matches my counter tops and my cabinets. and it goes a long with my cabin look.